Recorded at Coast Recorders, San Francisco, CA, December 1978. From this moment on (4:12) -- Emily (5:26) -- Sweet and lovely (4:29) -- Ambiance (5:43) -- You and the night and the music (3:27) -- If you could see me now (3:30) -- Lullaby of the leaves (3:51) -- No greater love (3:23) -- Polka dots and moonbeams (4:02). 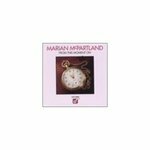 McPartland, Marian and Torff, Brian Q., "From This Moment On (CD)" (1991). Visual & Performing Arts Faculty Music Gallery. 28.